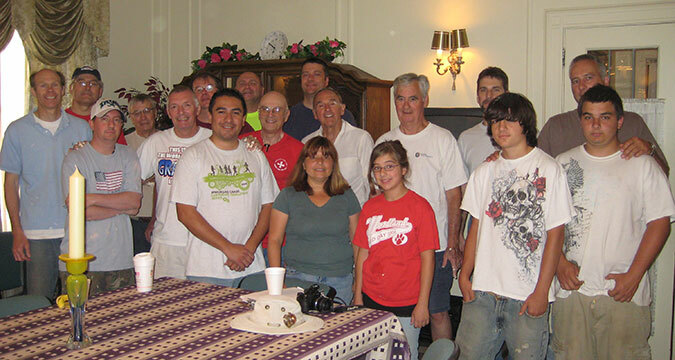 A faith-based volunteer group of second responder's, who bring hope to people in need. Hope’s on the Way, which has focused most of its energies on helping in the rebuilding efforts in New Orleans the past four years, took on another project closer to home this past summer. Four different teams ranging from a dozen to 21 people spent two weekends working at Our Lady of Peace Parish on Jeffrey Boulevard on the South Side of Chicago. The huge 90-year-old parish has struggled in recent years and maintenance on the buildings has not been kept up. The OLP project was the third “local” mission for Hope’s on the Way. Volunteers included deacons and lay people from all over the Chicago area. Six men in the Aspirancy phase of the Deacon Formation Program and their wives and/or families used the project toward their summer service project. 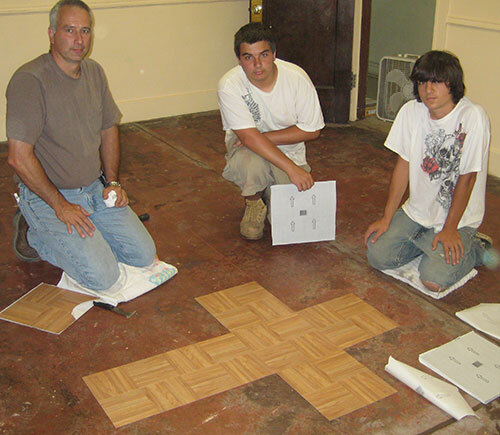 The project involved remodeling the basement chapel and two classrooms, which were cleaned, scraped and painted. One of the children’s rooms received new floor tile. In the chapel, the old drop ceiling was torn down and the plaster ceiling was patched and painted. The walls also were brightened up and painted and the old woodwork and baseboard was either replaced or repaired. An entranceway also was cleaned up and painted. New lighting was installed throughout the chapel by Deacon Larry Chyba, an electrician. Because of the additional volunteers, more work was included in the project. Two additional rooms and two different hallways were painted. A restroom off the chapel, which was in horrible shape, was gutted. A new cabinet, sink, faucet, lights and mirror will be installed at a later time. The project used 19 gallons of paint and hundreds of volunteer hours. Fr. Mark Kalema, who has only been pastor at Our Lady of Peace since February, was overwhelmed with the transformation of the chapel and the other rooms. “I don’t know how I can explain it to you. It is wonderful work that they did,” said Fr. Mark. Fr. Mark said parishioners are hoping to have an opportunity to thank the volunteers later in the summer. Tom Reinke and Mike Curtin work on walls of the basement chapel at Our Lady of Peace in Chicago. Mike Curtin and Jack Herrmann, who is in the aspirancy program of the Deacon Formation Program, touch up walls and paint pipes in the basement chapel at Our Lady of Peace. Congratulations! Fr. Mike Ahlstrom, vicar of the Diaconate, greets well-wishers during his 40th anniversary celebration in June. More than 150 people attended the Mass of celebration held at St. Barbara Church and the party that followed.